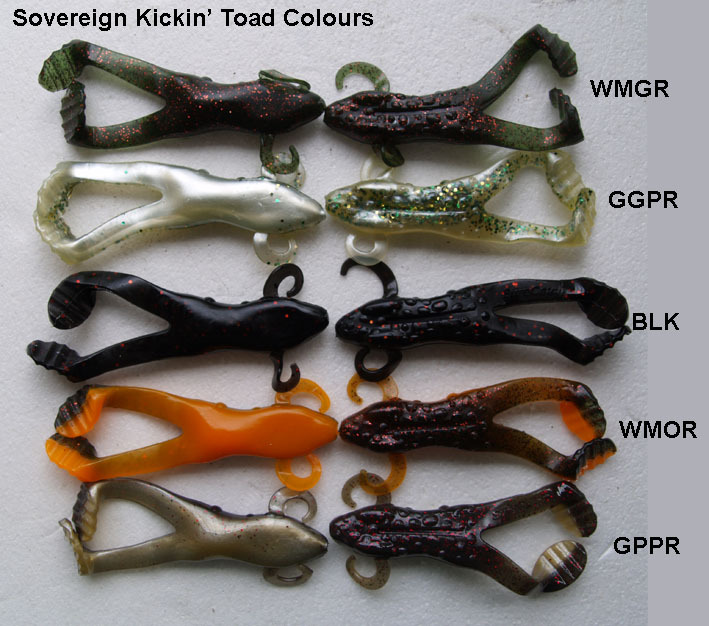 Sovereign Kickin' Toads: Is quite obviously a frog shaped soft plastic but with a difference. The paddle feet twist and turn in the water which even to the human eye actually look like they are propelling the bait. The two feet are cast in such a way that they have an opposing action, therefore the bait swims with incredibly good stability. When used simply with a weedless hook this bait can easily be kept on the surface and makes a lot of disturbance. It can also be fished Texas style with a bullet weight just in front to hop over sunken weed beds and obstacles or fished on a light jighead close to the bottom. 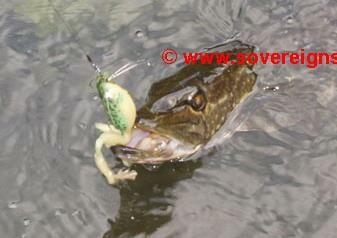 These baits have been featured in a couple of fishing magazine articles by UK named anglers. They have also been seen in the infamous hands of Jeremy Wade (if not these, something almost identical) in the River Monsters program when he was hunting "snakehead" in the Florida canals and this was the best lure of the day. Sovereign Jiggin’ Frog: We originally acquired these frogs as a cheaper “Do it yourself” alternative to Felmlee Frogs but when I showed the initial sample to Mick Brown at the NEC he asked for a jighead, rigged it up, showed us how he would use it and we sold just over 1000 in two days on Micks recommendation. 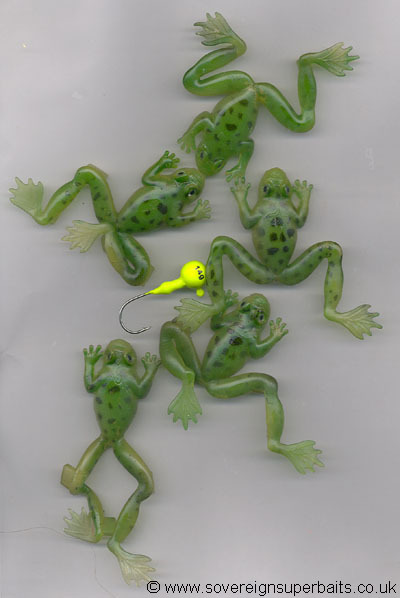 This frog comes in green, green or green although the spot pattern on the back varies considerably from frog to frog. Without a jighead these frogs float and as I’ve already said can be DIY-rigged on weedless hooks or whatever. These are an inexpensive fishing lure and a fantastic catcher, especially during spring and autumn when frogs are either entering the water to spawn or leaving the water to hibernate. Available singly or packs of five plus one free jighead.